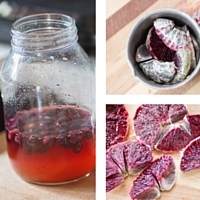 Sign up to learn how to make the easiest preserve of all: shrubs! A shrub is a way of preserving fruit or vegetable with sugar and vinegar. The result is a simple syrup (not unlike the flavored syrups in your favorite Italian soda) that is super versatile. These sweet tart syrups can be mixed in cocktails, in yogurt, with sparkling water, in salad dressings, and more! Enter your email to get the 6 quick to read emails (including recipes) so in a week’s time you will be enjoying your first shrub. Let’s get started!